Blewett and Dabney are easy to find – at least on the official highway Map. * They are in Uvalde County just West and South of the city of Uvalde. In fact, if you happen to have a brand new map (2001) - on the middle (fourth) vertical fold - just below the middle, you’ll see all of the word Blewett and the ey of Dabney. Like we said - finding them on the map is the easy part. Finding them in person is another matter. We did see some surprisingly scenic pits, however. After our fruitless physical search, we called the Uvalde County Tax Assessor’s Office to see what they knew. 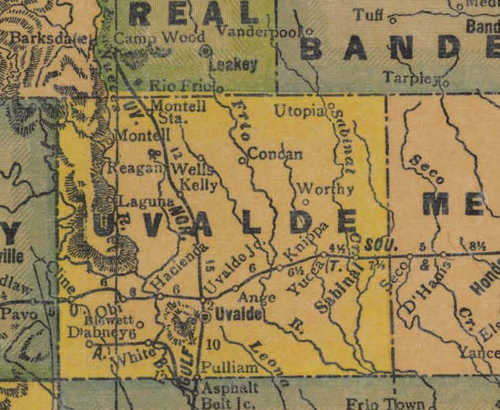 Since Uvalde only shows 6 place names on the entire county map – we figured we might have a chance. They had never heard of either town. The clerk asked if we were talking about YOU-valde County (like it's frequently mistaken for one of the numerous counties that sound like it). We asked if we could talk to someone in the mapping department and we were informed that we were already talking to them. When the rock asphalt is gone, we can see this becoming a great water theme park. Naturally the two alleged communities have a shared history. There is no longer any trace of either town. 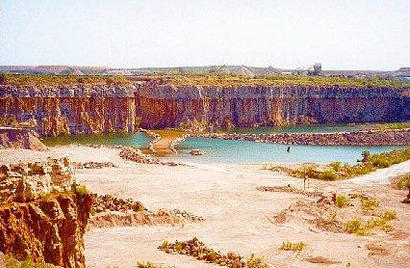 There are a few ranches around the company’s property that might account for some human habitation. 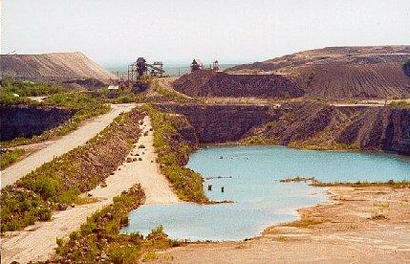 At one time Dabney was the only rock asphalt mine in the United States. The company has joined in partnership with several wildlife organizations in building and placing habitat and harborage for the wildlife in the area. The lakes (pictured) are stocked with fish from Uvalde’s National Fish Hatchery. Both men invited us on a tour of the company’s operations. Two years ago a rare black bear was seen on the company’s property. Someone managed to photograph it and it appeared on the cover of the Maryland Wildlife Conservatory’s Magazine. The TxDoT cartographer told us that he had found that once a city or town is incorporated – it stays incorporated until it’s officially unincorporated. Which means when a town is abandoned, the last person to leave should file un-incorporation papers with the appropriate governing body before turning out the lights. *This piece was written in 2001. After our interview with the cartographic department of TxDoT, both towns were removed from the state map, but not at our request.